Kwik Trip of La Crosse, Wis., is recalling Kitchen’s Cravings Premium Egg Salad Sandwich on Oat Multigrain Bread. The product may contain, fish or shellfish, allergens not declared on the label. No reactions related to this product have been reported to date. 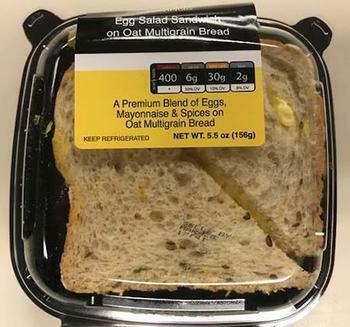 The recalled product, an individually wrapped Premium Egg Salad Sandwich on Oat Multigrain Bread with sell by dates of 3/25/18, 3/26/18, 3/27/18, 3/28/18, and 3/29/18, has the UPC code 3977900079 and was sold in Iowa, Minnesota and Wisconsin. Customers who purchased the recalled product should discard it immediately or return it to their local store for a full refund. Consumers with questions may contact the company at 608-781-8988.